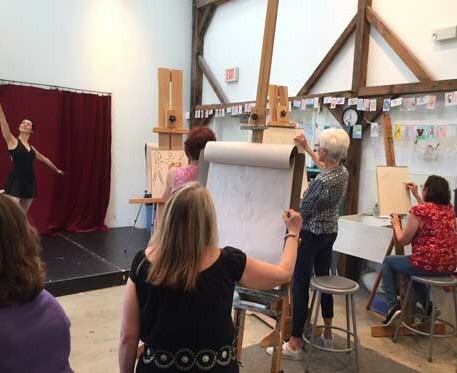 One day Figure Drawing Workshop for 3 hours located at Darlington Arts Center in Garnet Valley, PA, instructed by Annette Alessi. Model fee is separate and will be split between all the students the day of class. Total model cost is $45.00. With the use of a live model, students will receive a simple breakdown of the human form and the face/portrait, practice gesture drawing allowing for loosening up, and for the more advanced, individual guidance on portrait and figure drawing and painting. The instructor has an extensive background in the figure, having been a fashion illustrator in the early years of her art career. Read more about Annette in her bio. Click here to see some of Annette’s figurative works. Bring a large drawing pad, soft vine charcoal, charcoal pencils and a kneaded eraser. If you would like to bring painting supplies to attempt the use of the model in painting form, feel free to do so. The model will be clothed. Space is limited so please register soon. Credit Cards accepted. Checks also accepted. This workshop is instructed by award winning artist Annette Alessi and is held at the Darlington Arts Center, 977 Shavertown Road, Garnet Valley, PA 19060. Sign up for mailings for future dates and times this workshop is held. It generally runs 1 time per month. Contact me to receive a gift certificate to use for a friend, relative or yourself.